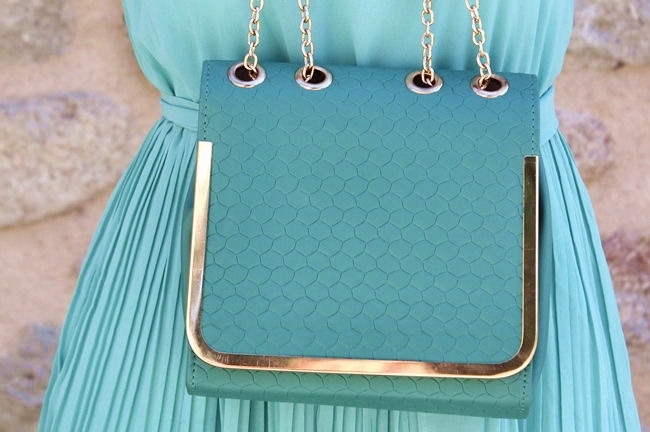 Everybody loves mint color in the summer! Even if you do not like to wear this refreshing shade that says more green than blue, then I'm sure you enjoy watching the others dressed in a mint! Svi vole mint boju tokom leta!!! Cak iako ne volite da nosite ovu osvezavajucu nijansu koja vise vuce na zeleno nego na plavo, onda sam sigurna da uzivate gledajuci druge obucene u mint! These mint colors are almost sort of like the waters of Greek islands on sunny days. Anyhow, your dress, handbag, and sandals are beautiful. Your smile and hairstyle are as charming as ever. Lovely necklace as well.